Deinonychus was the feathered dinosaur which its fossil was found with a big herbivore dinosaur’s. 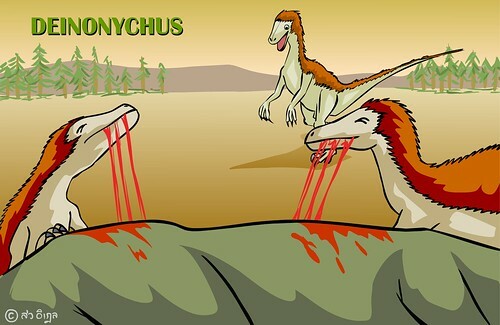 Many scientists believe that Deinonychus did not kill the big herbivore dinosaur, but it just ate the corpse. The opinion of the artist who makes this website is the Deinonychus’ claws was be able to hunt the bigger animals. Roll mouse over two big dinosaurs, you will see how it eats.